WAIST HIGH: Happy 25th Birthday Combat Rock. 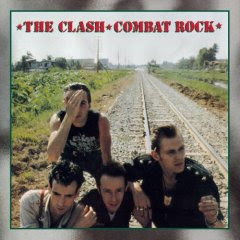 Happy 25th Birthday Combat Rock. The last Clash album to feature the original line up of Mick Jones, Joe Strummer, Paul Simonon, and Topper Headon, Combat Rock was "originally planned as a double album with the working title Rat Patrol from Fort Bragg." The album went to #2 in the UK and reached #7 in the United States, spending 61 weeks on the charts. The album features "Know Your Rights," "Rock the Casbah," Waist High favorite "Straight to Hell," and "Should I Stay or Should I Go?" "This is one of the band's best works, and defines that no matter what slice of meat they choose out, and how they cook it, it will always somehow come out being very damn delicious." The Clash are generally credited with pioneering the advocacy of radical politics in punk rock, and have been referred to as "The Only Band That Matters."